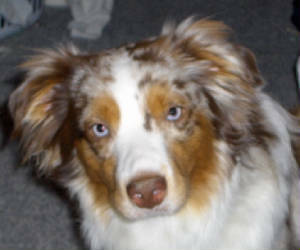 Indy has the typical aussie reserve, energy, attitude and brains all in a great looking package. 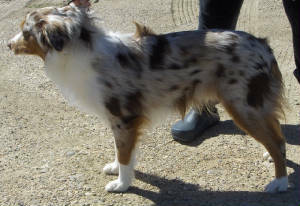 He is a Red Merle and stands 16 inches tall. Indy is now attending agility trials and is doing as wonderfully as I had hoped. Indy is the type of dog that will go to the top no matter what venue you put him in and I am expecting great and wonderful things from him in the future. Indy has had his preliminary X-rays and everything looks fantastic! 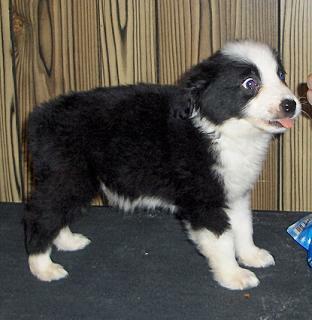 Introducing 'Oreo' (registered name is pending). He is the newest addition to our little pack, no pun intended..lol. 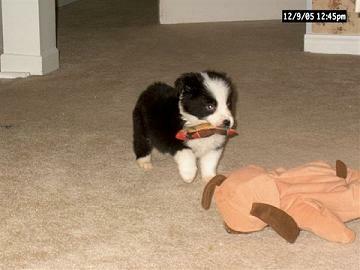 Oreo is a Black Bi, Toy Australian Shepherd with Blue and Brown eyes. He has fantastic bone and confirmation. 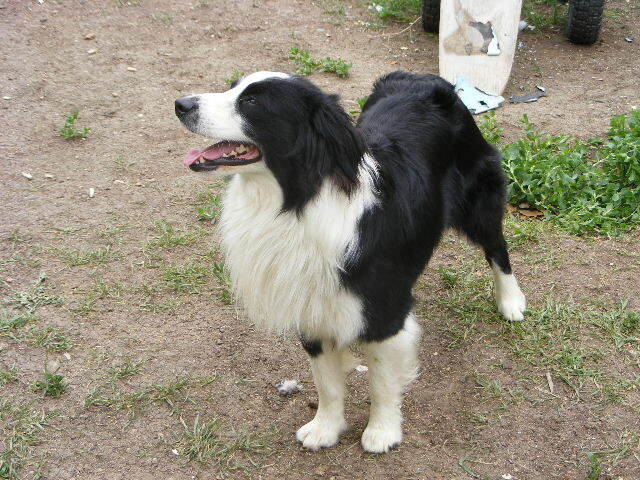 Oreo has a rambunctious personality and although he has the typical Aussie reserve he quickly warms up to you and loves to play. So far his favorite game is tug and chasing your fingers across the floor and even at this young age he is very toy and food driven. 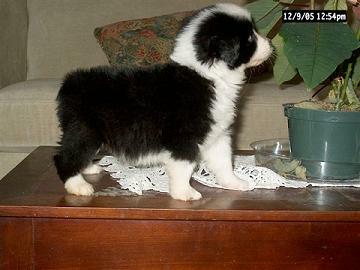 Oreo was born on November 3/2005 and at 8 weeks of age was 2 lbs. 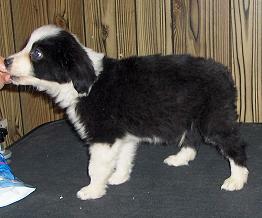 Oreo is now fully grown and is standing at 14" tall. 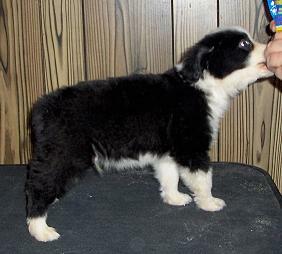 I want to thank Kathy Hacket of Skoaches Mini Aussies in Ontario for this fantastic opportunity to have such a great little guy here. 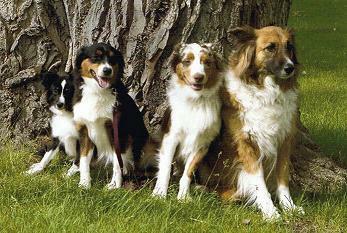 Oreo will of course be trained for agility and with his fearless personality I expect him to really excel in this venue. What Oreo really thinks of the Stacking idea! Oreo really likes this 'treat' idea! If you were to look into Indy's eyes in the picture below you will be sure to see the intelligence, humour, curiosity, and typical teenager trouble maker that makes Indy such a treasure. As the only male in a house full of females he tends to feel left out sometimes but always manages to make sure he gets more than his fair share of attention. When Indy is outside in the yard he forgets how to walk and runs full out everywhere. He can turn on a dime in a full run and loves to duck and dodge the other dogs as they chase him, which is his favorite game. However, while in the house he becomes an instant couch potato and just wants to lay on my feet or better yet snuggle on the couch. 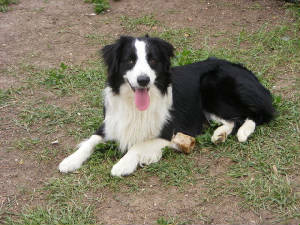 Indy is also the comedian of the group and keeps us giggling with his crazy antics all the time. He is definitely a pleasure and a treasure to own. Indy has shown his true intelligence, craftiness, bravery, and outright boldness! I was using a ladder to fix the screen on our kitchen window when I decided to take a break and come in for a drink. As I was getting my drink I heard a noise at the window and looked over in time to see Indy standing on the ladder and leaping thru the window! He came straight over to me and did a beautiful Obedience sit right in front of me. I was laughing too hard to be mad at him. Well, I managed to catch him doing it again, this time I had my video camera with me. Please click on the link at the bottom to see this little self-taught trick of Indy's. You will see Indy taking a quick peek out the gate to see if I was watching him, I was hiding behind my neighbor's fence! Also, please disregard the siding on the house, we were in the middle of scrapping all the old paint off so we could repaint it a different colour, it looks just aweful. Well, enjoy! Oreo also loves his toys! Getting the hang of this stacking stuff! Oreo is all grown up!